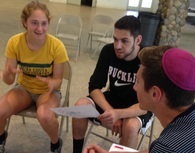 As a Tzedek American you will spend the academic year living communally in a supportive and creative environment. Throughout the year you will be involved in service projects locally and nationally. Several days a week will include internship with a social justice non-profit organization in Los Angeles and Southern California working on one of four issues. You will build your resume and create experiences that will serve you for the rest of your life. You will have the opportunity to to look at the problems facing the world and ask “why ?” And, “what can I do to make a difference?” A year on Tzedek America will teach you the tools to understand how to create systemic change. Click here to learn about our: National Service Trips each year! Afternoons will be a time for debriefing and processing your day. Often a Jewish text or secular reading or video will help guide the structured conversations each day. Evenings will offer a balance of free time, fun, exploration, and structured activities. Tzedek Americans live together in shared housing; they work together, learn together, and often spend Shabbat and holidays together. Living communally creates a wonderful opportunity for personal growth. Tzedek Americans are supported by the staff through community-building exercises, regular community meetings and other group programs. The community house is kosher, with gluten free and dairy free options for all meals. Once a semester the participants will host a semester culmination program for parents and invited guests. Participants’ final projects will communicate their own individual experiences through the use of blogs, photos, and other media. Your Tzedek America year will extend beyond your own experience and have an impact on the greater community.